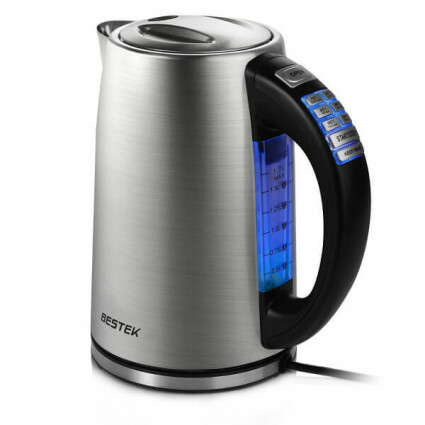 BESTEK kettle is temperature controllable to always provide you the tea or coffee with the perfect temperature and keep beverages warm for a long time. With six pre-programmed temperatures, you can bring out the flavours in your brew for optimum enjoyment. Keep coffee or tea always in the perfect temperature to give you the best flavors. Auto shutdown function can well protect your devices from damages; the lid can be opened automatically by pushing the button. Provide you 1.7L BPA-Free large capacity drinks; water level indicator reminds you when there is no water. Temperature Control: 70℃, 80℃, 85℃, 90℃, 95℃, 100℃.